Loft Conversion Company in London. Loft Conversions in and around London, UK. Best Loft Conversions in London, England. Service areas are Dulwich, Clapham, Wandsworth, Wimbledon, Crystal Palace, Herne Hill, Forest Hill, Honor Oak, Balham. Loft Conversion North London. Building contractors and loft conversion specialists offering loft and attic conversions for house extensions and home improvements throughout North London. 21 Eastern Road, Fortis Green, London N2 9LD, England. North London leading specialists in loft conversions. Cover all of the North London areas including Barnet, Islington, Haringey, Enfield, Harrow, Camden, Hackney, Edmonton, Tottenham, Finchley, Edgeware, Elstree, Kingsbury and Wembley. Loft conversion costs : The cost of a loft can vary greatly depending upon the size of the property, but the average cost would be between £30,000 to £40,000. Read more FAQ here. Experts in the design and construction of all types of loft conversions in North London. Loft conversion cost : for a simple eaves loft would most likely start from £20,000 including VAT, whereas a dormer with a bedroom and bathroom would cost between £30-40,000. No Obligation Survey. Covers Barnet, Enfield, Finchley, Haringey, Hendon, Southgate & surrounding areas in North London. Cheshunt, Harpenden, Hatfield, Hemel Hempstead, Hertford, Potters Bar, St Albans, Watford, Welwyn Garden City, Welwyn & surrounding areas in Hertfordshire. Attic Loft Conversion Specialists in North London and surrounding areas. Offers FREE no obligation quote. Brygola is a building & loft conversion company in London. Offering loft conversion in North London and loft conversion in East London area. 201 Murchison Rd, Waltham Forest E10 6LT. North West London Loft Conversion, East London Loft Conversion, South East London Loft Conversion, South London Loft Conversion, South West Loft Conversion. Godiva House, 1 Connaught Ave, Loughton, Essex, IG10 4DP. London loft conversion and home extensions. Based in East London and covers all areas of London – North, East, West, Central and South London. Offers loft conversions, extensions, new build, renovations, planning services. Free estimates and consultation. Another Level Lofts London Ltd. Leading loft convertors company in North London for all your loft conversions Muswell Hill, loft conversions Enfield and loft conversions Islington. Loft Conversion in North London and Hertfordshire. Bespoke loft conversion including Roof Window Loft Conversion, Hip To Gable Loft Conversion, Dormer Loft Conversion and Mansard Loft Conversion. Loft Conversions London, Essex & Hertfordshire. The Loft Converter is one of the leading specialist North London loft conversion companies, with 50 years of building experience in and around London, Essex and Hertfordshire. Specialising in loft conversions, building extensions, home extensions and refurbishments. Loft and Attic Conversions in Clapham, South London. Offers Loft Conversion, Attic Conversions, Dormer Conversions, Bedroom Conversions, Garage Conversions, Bathroom Conversion. 904 London Road, London CR7 7PE, England. Loft conversion company for more than 15 years, offers a bespoke service, based on clients’ specific requirements, and therefore each conversation, whilst based on a standard type, is unique. 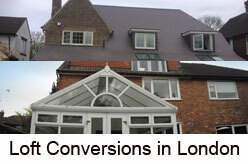 LLAC is a loft conversions company based in London. Offers loft conversion and house extension, domestic construction and complete refurbishments from start to finish. Covers across the East and North London. Walthamstow, London, E17 8QJ, United Kingdom.